Martin Luther King’s youngest child is taking over the family business. She discusses responsibility, legacy, and growing up under a shadow of tragedy. 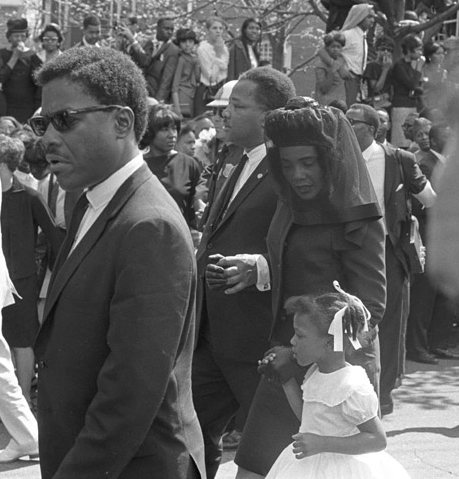 When Martin Luther King Jr. was assassinated in 1968, his youngest child was just five. She had spent little time with her father; he was so often on the road—jailed in Birmingham a few weeks after her birth, addressing 200,000 people on the National Mall when she was five months old, marching from Selma to Montgomery when she was a toddler. So she clings to her single vivid recollection: When he came home to Atlanta, she would sit on his lap to play the “kissing game.” There was a spot on his face reserved for each of his four children; the forehead belonged to Bernice. Other memories are scattered snapshots: her dad catching her brothers as they leaped from the refrigerator in the kitchen of their redbrick home on Sunset Avenue, or him sitting at the table, snacking on scallions. When she saw him in his casket it looked like he was sleeping, and she wondered if he was hungry, and if so, whether he’d care for a green onion. As children of one of the most iconic men on earth, Bernice and her siblings—Yolanda (who died in 2007), Martin III, and Dexter—were tasked with carrying on the legacy of a man known as the “conscience of America,” even though their own memories of him could be summoned only in fragments. Dr. King’s most famous speech mentioned a dream that his children would one day be judged solely by the content of their character. Could he ever have imagined such words would set them up for a lifetime of judgment? The Kings’ inheritance is complex. Their father bequeathed them the burden of great expectations; as children of a world leader for peace and justice, they are presumed to be leaders, just as young princes are destined for thrones, whether equipped to rule or not. Dr. King left them something else. Although he famously cared little for money—he donated his Nobel Prize cash to civil rights causes and died with only $5,000 in the bank and two suits in his closet—his advisers persuaded him to copyright his works. You must leave something to your wife and kids, they insisted. 1966: The Kings’ last official portrait. Few families occupy such a vaunted position in modern history. The copyright enterprise—the estate King Inc., and Intellectual Properties Management, which licenses King’s works and image—has been managed for years by Dexter, the younger son, a sometime actor and producer who lives in Los Angeles. While most Americans may believe MLK belongs to history, the tangible stuff he left behind—books, recordings, letters, and indeed his very likeness—remains the property of his heirs. For instance, the family holds the copyright to King’s “I Have a Dream” speech through 2038; if a news outlet wants to rebroadcast the speech in its entirety, the fee is at least $1,700. The King monument, a thirty-foot sculpture of the preacher carved out of granite in Washington, D.C., cost private benefactors and taxpayers $120 million; a portion of the cost—$800,000—went to Intellectual Properties Management for the license to MLK’s crossed-arm likeness and to inscribe his quotes on the statue’s base. 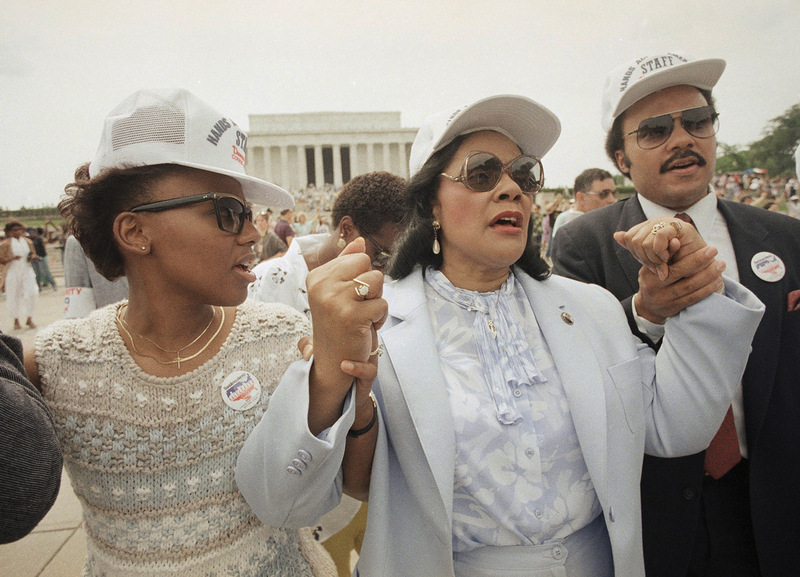 When Coretta Scott King died in early 2006, most of the King Center’s programs had been discontinued, and the compound—chapel, administration building, auditorium, small exhibit space, and gift shop—was in disrepair. When Mrs. King’s remains joined those of her husband in the marble crypt, the cracked reflecting pool surrounding the tomb bloomed with algae. After their mother’s death, it was Bernice, the youngest sibling, who took the lead in coordinating the nationally televised funeral attended by four presidents. She delivered the eulogy and—as her mother had done decades earlier after her father’s death—served as the gracious public face of the family’s personal grief. “She had to step out of being Bernice King, daughter, to take on this other role, to be a caretaker and to comfort the masses,” says Imara Canady, a former executive with the National Center for Civil and Human Rights and a longtime friend of Bernice’s. Relations between the siblings soured following oldest sister Yolanda’s death from heart disease in 2007. In 2008 Bernice and Martin III sued Dexter over his management of their father’s estate, including the licensing deal for the monument. Dexter in turn sued Bernice for refusing to release some of their mother’s papers. The Kings settled, and in 2009 a judge appointed attorney/entrepreneur Terry Giles custodian of both the Center and King Inc. Serving as a sort of tough-love counselor, Giles helped the siblings craft a business plan and carve out a truce. Today Dexter chairs the King Center board but remains focused on the intellectual property business. Martin serves as a Center board member. The daily operations of the King Center are left to Bernice, who has been CEO since January 2012. 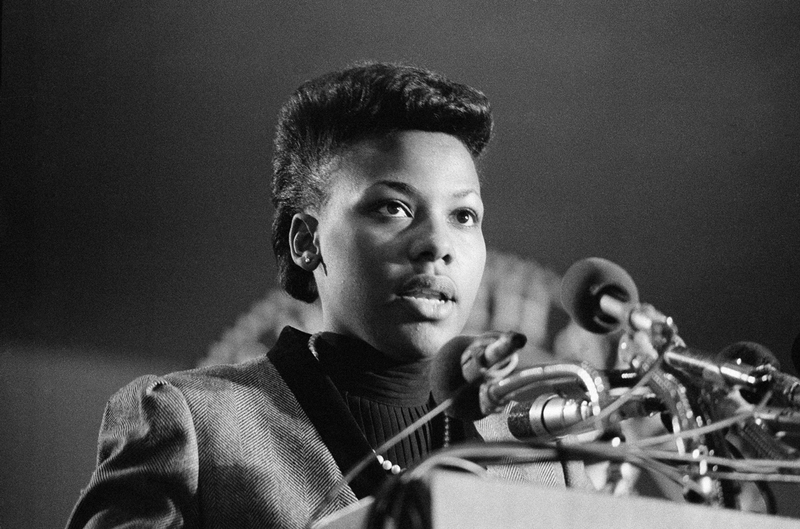 Bernice King speaks at the Health and Human services headquarters in Washington, D.C., in 1985. In her first eighteen months running the Center, Bernice King has upgraded and repaired facilities, smoothed relations with the Park Service, and addressed basics; now when you call, someone actually answers the phone. Once the Center’s website barely functioned; now staff steadily tweet and post Facebook updates. Through a partnership with JPMorgan Chase, the Center is digitizing its one-million document archive. 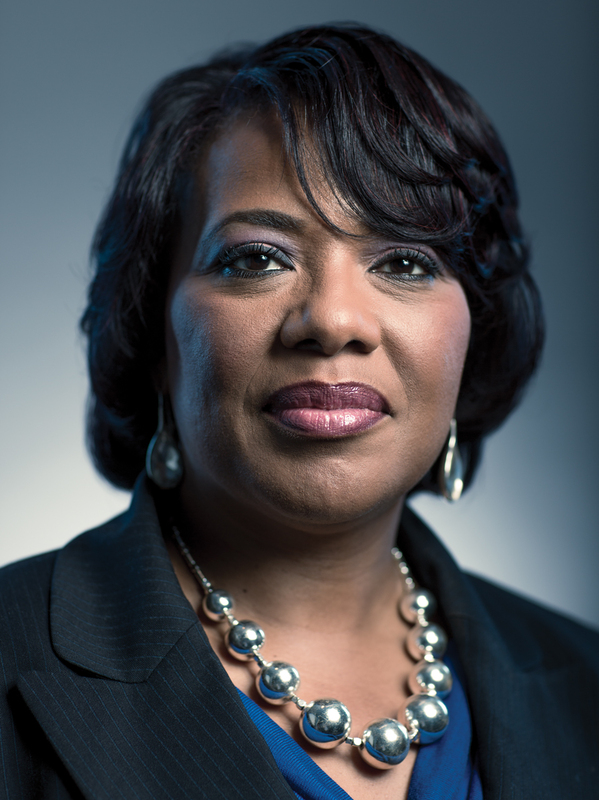 Along with professionalizing the Center’s operations, Bernice King seized its bully pulpit. This April, on the anniversary of her father’s assassination, she launched 50 Days of Nonviolence, a national awareness campaign aimed at teens and young adults that includes a curriculum for school-age students. She spoke at schools, churches, and colleges and solicited celebrity backers—the Atlanta rapper 2 Chainz and Chicago-born actor/rapper Common. She also launched a summer training program for college students. “She’s doing a great job, and it’s not an easy one,” says former Mayor Andrew Young, a colleague of King’s who serves on the King Center board. “There is a tension between celebrating history and making history,” he says. The Center, Young believes, needs to be less of a shrine and more of the think tank it originally was intended to be. In late May, King discussed with Atlanta magazine the challenges of embracing her legacy, following her father into the pulpit, and taking over the Center founded by her mother. Let’s start by talking about your mother. You’ve discussed studying your father’s writings, but I’m curious: What’s the best advice you got from your mother? I often have heard you introduce yourself as the daughter of Martin Luther King and Coretta Scott King. Andrew Young has said the movement would be very different if he and your father had had other wives—and without the influence of women like Juanita Abernathy. During this fiftieth anniversary year, are you doing things to recognize the role of your mother and other women? Not necessarily. There is so much emphasis on the memory of those moments on the Mall. Of course my mother was present, but obviously in the background. Because of the momentum around all of that and the obviously famous speech—if not the most famous speech in the entire world—I’m always concerned about her getting lost as we continue to advance my father’s legacy. My father was one of the most hated men in America in 1968 when he was assassinated, and now you can look around forty-five years later and he is one of the most loved men in the world. And you could say that different things contributed to that, but I think the main factor was the steadfastness and devotion and dedication and sacrificial commitment of my mother to carry on his work after his assassination. I am—and perhaps because I am female—constantly thinking about, how do we enshrine her work? People don’t really understand the enormous contribution she made to this city, even from an economic impact. It’s still high up, but at one point, the Center was the most visited place in the state of Georgia. The internationalization of Atlanta, it’s a mix, yes, of the work of Ambassador Young and others, but I think it’s also in tandem with what Mother did to really carry that message internationally. She traveled and did nonviolence workshops that connected with movements around the world. It became very popular in many places. Speaking of not escaping: You’re in the ministry like your father and running the organization your mother founded. How did you come around to embracing this? That was a constant reminder and continued to resonate. And then I had enough time to grow up and know Bernice—the good, the bad, the ugly—and didn’t feel like I felt at that earlier age, that I would be lost. Without my ministry I would just be Martin Luther King’s daughter. You know, when people call me that it doesn’t bother me anymore. I know I am not my father. I know I am me. When I speak, there is a lot of trepidation, but in that moment when I surrender myself to the Holy Spirit and get in that zone, that’s a place and a space where I connect with Bernice and her unique expression. For some people my speaking reminds them—gesture-wise and intonations—of my father, but I am very congruent with myself. I don’t feel like I have to be him. When it’s all said and done, even though I know the majority of people show up because I’m Dr. King’s daughter, I also know, because of things people have said to me, that Bernice touched them. So I am settled in that now. And I feel it an honor and privilege to serve both the Kingdom of God and my parents’ legacy. It’s a humbling experience on a daily basis. My mother’s death was a major turning point. Once she passed, it was like, “My God, it’s up to the four of us.” Everything she tried to prepare us for, that was the moment. We had to step up to the plate. And it was not dread, like “We’ve got to do this.” Her death was almost like a rebirth for me, in terms of understanding that I come from roots of greatness and I am called to greatness and there’s nothing I can do but try to be my best self. What was once something I resented, I now feel honored to carry. You know, it’s so much a part of me now. It’s always been part of me, but I am awakened to it. Being with her at those last moments really cemented that for me. I don’t know how to describe it to you, but I literally felt something transfer in that moment. I had this—I don’t want to call it an out-of-body experience, but I felt like when her mother passed, it moved on to her. And now it was with me. 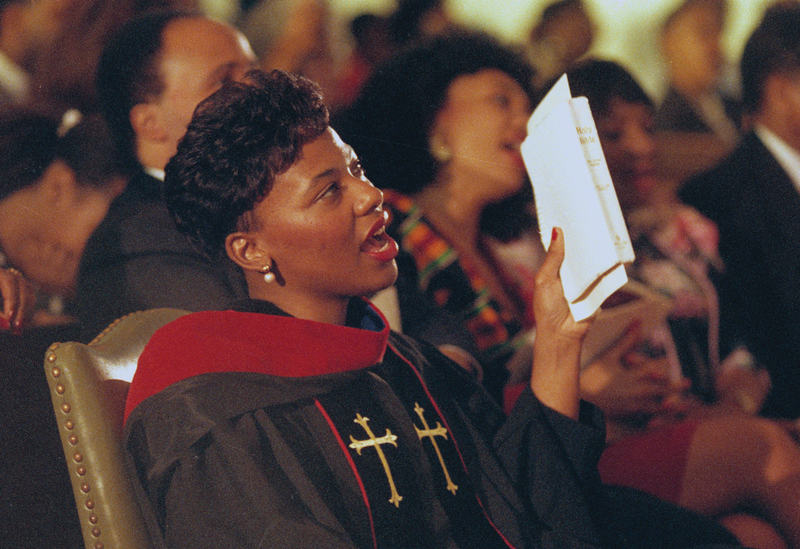 1990: Bernice at her ordination service at Ebenezer Baptist Church. Her father, grandfather, and great-grandfather pastored at the church. As you described earlier, you experienced all these tragedies, many when you were very young. How do you find strength? A lot of prayer. Some crying. Some screaming. [Laughs] Having those honest moments. I visit these emotional places, but I do not take up residence. I don’t buy furniture, don’t get a bedroom, I’m not staying there. But I visit. If I am having a sad moment, people criticize me: “She’s unapproachable. She has a mean look. She doesn’t smile.” I used to get that all the time. I know I smile. I’ve seen myself smile. I don’t know why people catch me on the bad days. But I know, hey, I can have a bad day. That’s okay. If people want to criticize me, that’s their issue. I do live with all this. If people try to deny stuff, it just comes up in all kinds of other ways. So you know, my way is just to face it head-on. I have friends and close people that I reach out to and talk to and get naked and transparent. You can’t try to carry life alone, which a lot of people do. You and your siblings had such a singular experience. Have you found anyone you can relate to? [Laughs] There are literally no people that would fit that role. We are unique, period. I don’t know anybody who has two famous parents that people truly admire. That’s the first thing. And my father was labeled the moral leader of America. I mean, my God, a celebrity moral leader of America. The bar is past the ceiling, way up in the stars somewhere. People don’t have as much mercy. They don’t give you much credit. I try to look at commonality. What moments do we have in common? Because nobody fits the bill. Even we don’t, because you know, I’m young. Yolanda was almost eight years older; she experienced part of the movement I never did. Dexter and Martin, they’re guys; I’m a lady. Guys process things differently. So basically it’s me. The people who lived in the movement, even the children of the movement, are different. Our parents had different roles, they carried the movement in different forms and fashions, and we had unique experiences. We have some things in common. There’s a lot of trauma. That movement was traumatizing. You would think that all of us in the next generation would have some kind of bond, but I think because of all the trauma we don’t. And in our community, in the African American community, there is a lot of pride when it comes to psychology, counseling, all that kind of stuff. Keep it quiet. Keep it in the family. So you kind of live with all that inside of you. Which is unfortunate. 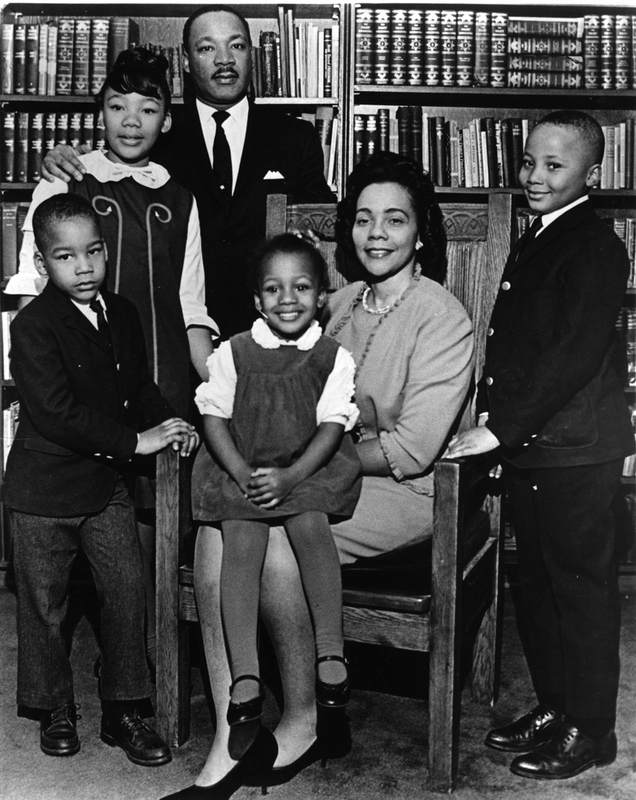 Because I do think if there is anybody who would be the closest to understanding the peculiarities, it would be those offspring [of civil rights leaders], whose parents went on to do other things, like Ambassador Young. I don’t even think we stop long enough to realize we can really help each other. During King Week events in January, I heard you talk about reforming the Center “from the inside out.” Can you elaborate? I’ll say it simply like this: The reason my father was an effective leader is because he lived what he believed. He didn’t get on a platform and just talk about nonviolence; he embodied it. The most effective part of the King Center is when those of us who make up the administration and staff can embody those teachings. One of the things I have been doing is having them do what my mother used to say: “Go to the source.” We’ve been reading books my father authored. A lot of people don’t even know he wrote books. And believe it or not, there have been seasons after my mother’s leadership when people [working here] were not studying him. We work for the King Center; we need to know the mind and the philosophy of Dr. King. We have been reading the books and talking about them in our meetings. It doesn’t matter if you work in facilities, if you are the receptionist, if you are the director of marketing; if we have guests and we want to do an hour session around Dr. King and some aspect of his philosophy, teachings, work, I should be able to call on any member of the staff and they should be able to articulate that. To me, when you’re healthy on the inside, you are able to meet the outside demands so much better. I can’t change anybody but Bernice, but I certainly can create an environment to help people help themselves. What roles do your brothers play now? Martin is just on the board of directors. Dexter is the chair. Not regularly. We have board meetings and see each other every few months. You’ve said that you are not just the daughter of Dr. King, but also his student. Is there a teaching or writing that is significant, outside of the most famous ones like the “Dream” speech or “Letter from Birmingham Jail”? For me as well, there was an interview that he gave to Mike Douglas in 1967, about his opposition to the Vietnam War. There was a question in that interview that constantly resonates with me. That kind of courage of leadership is what we lack. I wish more people could grasp it. That kind of statement may get you the Nobel Peace Prize, but it won’t get you other accolades. Pop culture is about what’s popular. The South—and the nation—would not have changed if he had been a consensus leader. In the popular history of your father, people remember “Dream” and his crusade for civil rights. But his other platforms—fighting poverty, antimilitarism—seem to get lost. Was that part of the reason behind your 50 Days of Nonviolence campaign? You have to take this part in stages and steps. Baby steps. Whether we want it or not, we live in a violent culture. And I don’t mean only video games or people on the streets. I mean in our discourse. We scream and holler, make disparaging comments. It’s a violent culture. If you are going to shift it, you have to spoon-feed it like a little baby. So 50 Days was really about buzz, to get the notion of nonviolence out in the culture. This has been a tough 365 days in our nation. The interesting thing is, the more you keep it out there, the more people get wind of it. For instance, Columbia, South Carolina, is now doing 100 Days of Nonviolence. And in Greenville, South Carolina—because we know in the summertime kids get in more trouble—they are doing 107 Days. Some people want to say this is a movement. I don’t know if you start movements. You just start doing good work and people put labels on it. We are in the next stages of starting in January, with the King Holiday, 100 Days of Nonviolence. This time was really a start, to get people at least thinking. Is this something you see taking the form of political advocacy? For instance, you have spoken out about the need for gun control. Technically, although we as individuals have been activists, technically the institution is not set up to be an activist organization. It is more of, if you want to call it, a think tank. More focus on teaching and education. Where we give people the tools and equipment to go into their communities to address those issues. We give philosophy and methodology. The idea is really to help to develop a new mind-set. Because if the mind-set is there, whether we are talking about gun control or any other issue, this whole yearning people have for a more just, peaceful, and humane society will be on its way. When it came to addressing prejudice, your father battled direct issues like voting rights and access to public facilities. Your mother was outspoken in support of gay and lesbian rights. What do you see as the next front? There will always be prejudices, no matter how much we try to dwell upon getting to a place where we don’t have prejudices. The irony in my father’s situation is, he talked about integration, integrated neighborhoods, and yet he lived in a black neighborhood. His heart was not hostile or hateful toward another race. But people have preferences. A lot of times what we call prejudices are preferences. How do you get to a place where everyone likes all vanilla ice cream or all lemon custard? They don’t. I like my vanilla and you like strawberry and we’re not hustling and fighting over vanilla and strawberry and making a mess out of it. We’re going to have to find a way to settle down and accept our shortcomings and our differences, period, and give people room to exist in that space. What I struggle with is when we disagree. People have labeled me homophobic. If I was homophobic, I wouldn’t have friends who are gay and lesbian, so that can’t be true. But because I have a certain belief system, I am now the enemy. And I’m not the enemy. I have love for everybody, period. I don’t think it’s my role and responsibility to take on a platform unless God calls me to it. That’s not something I feel called to do. When my mother was alive they tried to pit us against each other. I love my mother and she loved me. They couldn’t divide true love. We had good conversations concerning this whole issue. But I think we have to be careful in our nation that we don’t demonize everyone who doesn’t agree with us. It’s almost coming to the place where people feel, “If I don’t agree, then I will be ostracized.” And that’s unfortunate. The issues and concerns that I keep hearing about are that people address certain rights, and there are ways to do that without changing what has never happened before in civilization. I value marriage between a man and woman. Spiritually I value that. Psychologically I value that. I know that the absence of my father in my life had its cost. So, your gay and lesbian friends, you wouldn’t want them to be able to marry? I wouldn’t marry them. But I don’t dictate that. That’s society’s call.